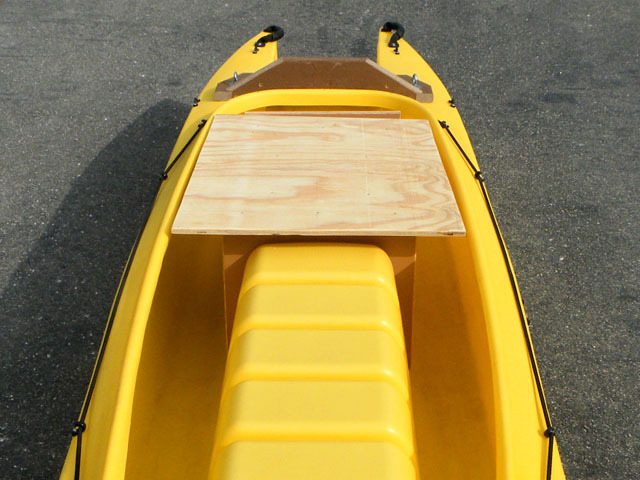 Platform for standing higher on a kayak – for sight fishing, poling, etc. Creating such a platform is easy and inexpensive, and you can design its surface area to be bigger or smaller, according to your needs. Furthermore, you can move this platform fore and aft along the saddle, to fit variables such as your weight and your fishing needs. The versatility of this platform is also manifested in the fact that you can sit on it with your legs in the hulls, and your feet resting comfortably on the bottom. In this position, you can paddle, or operate an outboard gas engine mounted at the transom. Naturally, when standing higher on a kayak, you lose stability, which is one of the reasons the W kayak is stabler for stand up fishing than all other fishing kayaks out there, and why it’s recommended to stand in a W kayak with your feet at the bottom of its hulls. The stand-up platform seen in the above picture would place you 16″ higher than if you stood on the bottom of the hulls, so you should expect to be less stable. BTW, you can pole a W kayak while standing in its hulls, and there’s no real need for you to stand higher for this purpose. 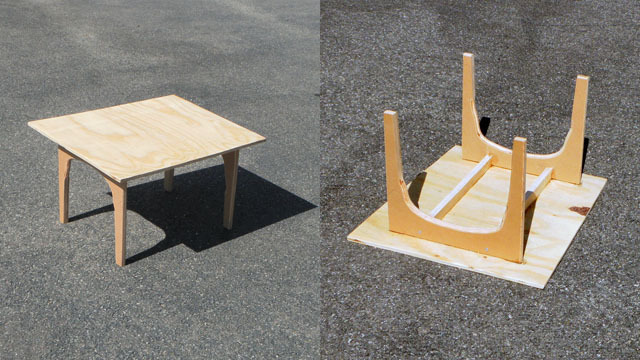 This stand up fishing platform is based on a pair of saddle brackets, but it’s possible to make one using different structural elements, and extend the platform’s width out of the cockpit. Having said that, one should remember that an adult cannot stand on one side on the kayak, especially not at such height. Fly fishing sometimes requires scouting, and some fly anglers like to practice sight fishing, which consists of casting a fly at a fish as soon as they spot it. Standing higher adds some visibility in such cases, but reduces the effectiveness and ease of paddling, and increases the likelihood of losing balance and falling overboard, as if you were standing on a regular fishing kayak, and not in a W kayak, in which the saddle and extreme stability enable you to regain your balance and stabilize yourself instantly and intuitively in most cases.